Develop and build on your skills and progress through to wet bath and blow-drying techniques across a number of cat breeds. Study the different types of coat (each cat is unique) and learn about its structure, and the consequences of over- or under-brushing. Expand your knowledge of the different types of cat shampoo and explore the advantages of hand blow-drying and the disadvantages of cage blow-drying. On this course we also look into the spirituality of cat grooming – do cats have a soul we can connect with? Three days of intensive tuition in bathing, blow drying and styling short and long-haired cats. 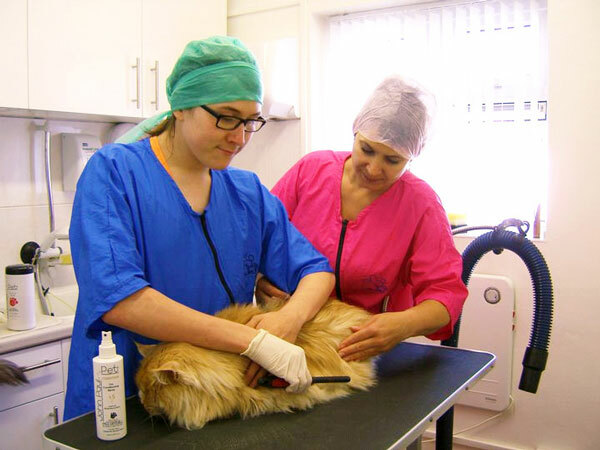 The course has been designed in continuation of the Foundation Cat Grooming Course or for people with some experience of handling and grooming the cats, subject to a practical and written assessment. You will learn everything you need to know about anatomy, and doing health assessments on your cats. You will also learn the basics of skin disorders and how to spot them, and we will look at the advantages and disadvantages of bathing a cat. We look at the law on medicated shampoos and flea treatments, and learn the consequences of declawing (which is illegal in the UK). We also look at introductory aspects of cat psychology and behavioural issues around grooming. By the end of this course you will be able to carry out a competent full grooming of short- and long-haired cats, including wet bath with shampoo, blow dry and styling. You will have a good understanding of cat grooming theory and the relevant cat anatomy. Please note that all our courses are in continuation progress towards the Master Cat Groomer certificate and therefore there will be no certificate awarded on this level.